Greyt Exploitations is a non-profit making organisation formed in 2008 and run entirely by volunteers. We strive to raise the public’s awareness of the cruel and inhumane treatment of greyhounds in the UK and much of our research and investigation work has been published in the national press. This has helped us to effectively campaign for stronger protection laws and for the gambling on dogs to be outlawed in Britain. Make it compulsory by law for the Greyhound Board of Great Britain to publish detailed monthly injury statistics. 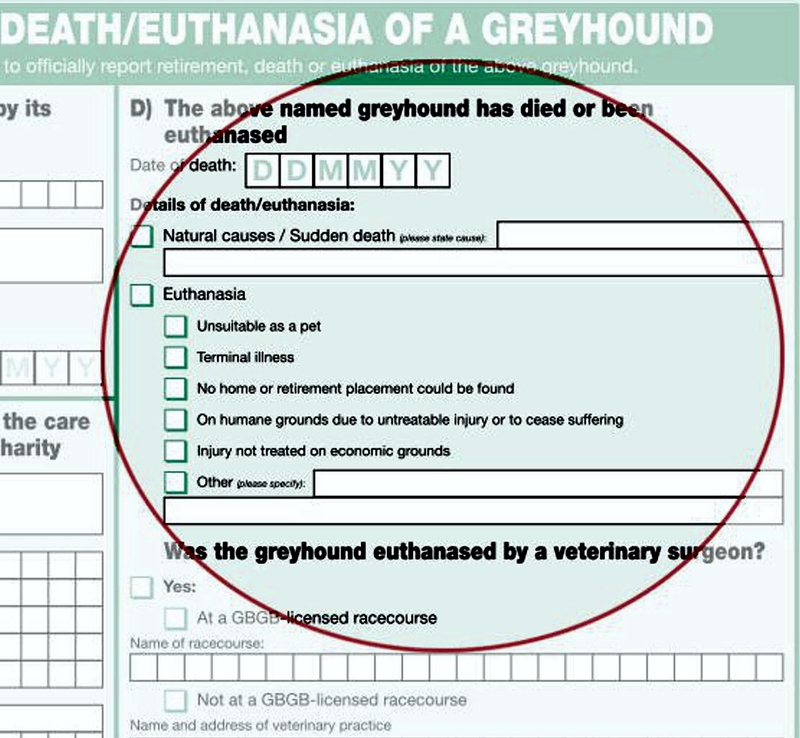 The database at our sister site – greytexploitations-greyhound-data.com – contains details of greyhounds involved in track incidents where a dog either Did Not Finish (DNF) – Finished at a Distance (DIS) or Finished Lame for all GBGB licensed tracks from 2005 to 2014. The information has been gathered over a period of 4 years from various websites that publish racing results but we have only published data that can be verified via a link to the GBGB website. In this respect – we cannot guarantee full disclosure by the GBGB of ALL dogs involved in incidents due the inconsistency of the way results are recorded from track to track – so in essence there may be many more incidents that we have been unable to identify. The destruction of healthy greyhounds deemed no longer suitable as a 'betting product' - too old or slow - if no retirement home can be found. The destruction of dogs that sustain treatable but 'career ending' injuries on the dangerously configured tracks designed purely for the spectator. In 2016 the racing industry failed to account for over 10,000 greyhounds bred for British racing - 85% of which are bred in the Republic of Ireland - despite much of the data collected by them via the GBGB Retirement Form. Efra estimate that 3,700 of those 10,000 greyhounds go unaccounted for after they have finished racing and earned the bookmakers millions of pounds profit. "Greyhound racing is a self-regulating gambling business that depends on the uncontrolled breeding and unaccountable disappearance of thousands of dogs every year. That is a situation that is unacceptable and indefensible"
Tia Rescue have in excess of 70 greyhounds looking for tender loving care which they so desperately deserve. If you would like to offer a forever loving home to a rescued greyhound please click on the image – thank you! The GBGB has attempted to conceal the extent of track injuries and what happens to injured dogs but we believe the industry has a moral duty to be accountable and transparent regarding a dog’s fate once they’re deemed a financial liability. Greyhounds are sentient creatures – not disposable gambling chips and the public have a right to know their whereabouts. We’ve opened a petition at change.org that will go to The Department for Environment Food & Rural Affairs. We want to make it compulsory by law for the Greyhound Board of Great Britain to ppublish detailed monthly injury statistics. Please also visit our Facebook page for latest news.